Star King is a smasher renowned as one of the best players on the East Coast and one of the strongest keyboard players in the world, known for his skill with many characters. He is a Fox and Kirby main, but also uses Yoshi in tournaments. He is currently ranked 40th on the 2017 64 League Rankings. He is one half of the Keyboard Warriors team along with Killer, where they have made strong impacts at national tournaments, such as a 2nd and 3rd place finish at the Apex tournament of 2014 and 2015, respectively. He has defeated several high level players, including Firo, Banze and Czar. He managed to finish 9th at Apex 2014, losing to SuPeRbOoMfAn 0-2 in the winner's side and getting eliminated by Wizzrobe 0-2 in the pool's finals. 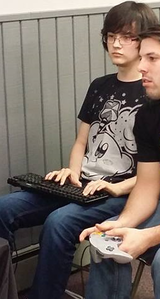 He then attended Apex 2015, where he also placed 9th, defeating Revan 2-1 but losing to Dext3r 1-2 and KeroKeroppi 1-2. This page was last edited on January 8, 2019, at 16:58.